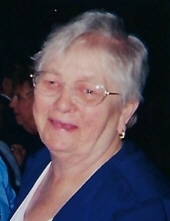 MARY R. “RITA” McNAMARA, age 80. Beloved daughter of Thomas and Catherine (nee Mulloy) McNamara; beloved sister of Thomas (deceased) (Joanne), Ann Mulgrew (Frank) (both deceased), John (deceased) (Faith), Kay Lindsey (Jesse) (both deceased), Sheila, Alice Gerba (Larry) and Michael; treasured aunt, great aunt and great-great aunt to a big clan; cousin and friend to many. Passed away Monday, September 17, 2018. The family requests all to meet for her Funeral Mass, Transfiguration Parish 12608 Madison Ave. Saturday, September 22 at 10:00 a.m. Interment Calvary Cemetery. Friends may call at THE McGORRAY-HANNA FUNERAL HOME OF LAKEWOOD 14133 DETROIT AVE. FRIDAY 3-7 P.M. In lieu of flowers please bring non- perishable food items for the Transfiguration Parish Food Basket. "Email Address" would like to share the life celebration of MARY R. "RITA McNAMARA. Click on the "link" to go to share a favorite memory or leave a condolence message for the family.